Hendricks is a Ph.D. candidate in the Department of Animal and Dairy Sciences at the University of Georgia (UGA). Tucker is an assistant professor and Hancock is the extension forage agronomist, both at UGA. Producers in the Midwestern, Western, and Northern states are no strangers to the benefits of alfalfa. They know alfalfa is an excellent source of protein and digestible energy for livestock. Yet, producers in the Southeast are skeptical about alfalfa’s ability to successfully grow in their hot and humid environment. Over the last 20 years, though, several alfalfa varieties have been released that are much more suited to the region. These varieties have been bred for greater pest and disease resistance, heat tolerance, the dual use of hay/silage and grazing, and semi- or non-dormancy, allowing for a longer growing season. Depending on location, producers in the South can expect from five to 10 cuttings within a single growing season, thus making the “Queen of Forages” much more practical. Even with these newer varieties, Southern producers are slow to adopt alfalfa on a widespread basis. This is in large part due to the success of bermudagrass as a warm-season perennial. When nitrogen fertilizer was cheap, bermudagrass was king because of its extremely high yields — Tifton-85 can produce 7 to 11 tons annually — and moderate quality. This combination of yield and quality makes it a popular choice for growers. It is important to remember, however, that high yields require high soil fertility. Additionally, bermudagrass quality usually isn’t enough to maintain body condition in lactating cows. Forage quality can drop rapidly if bermudagrass is not harvested on a timely interval, leading to extra costs for feed supplementation. Research from the University of Georgia shows that interseeding alfalfa into bermudagrass may boost protein by more than 50 percent and push total digestible nutrient (TDN) concentrations above 62 percent, thus reducing the need for supplementation. Plus, it can do it without sacrificing the high yields of bermudagrass and virtually eliminate the need for added nitrogen. Though producers have some control of forage quality through variety selection and harvest timing, no one is immune to the impacts of weather. As much as we would like to control the weather, it is often the biggest challenge to producing high-quality hay. This is especially true in the Southeast, which is known for its high humidity and frequent summer storms. In this environment, it can be nearly impossible to find three or four rain-free days to dry hay during the peak growing season. Since baleage is harvested at a higher moisture, it reduces the number of rain-free days producers need between cutting and baling. This drying window can help producers maintain a desirable harvest interval, thereby optimizing their forage quality. Combining the reliability of baleage and quality of an alfalfa-bermudagrass mixture, without sacrificing yield, would be a game-changer for producers in the Southeast. bermudagrass baleage is ongoing at University of Georgia’s Coastal Plain Experiment Station in Tifton, Ga. At this location, Bulldog 805 alfalfa that is interseeded into Tifton 85 bermudagrass is being compared with a Tifton 85 bermudagrass monoculture receiving nitrogen fertilization. Bulldog 805 alfalfa was interseeded in February 2016 and both treatments were harvested on a 28 to 35 day cutting interval during the 2016, 2017, and 2018 growing seasons. dry matter per acre than the mixture in 2016, the mixture began to thrive that fall. An additional harvest of the alfalfa-bermudagrass mixture in November 2016 helped to close the yield gap and set the tone for the second and third years of production. 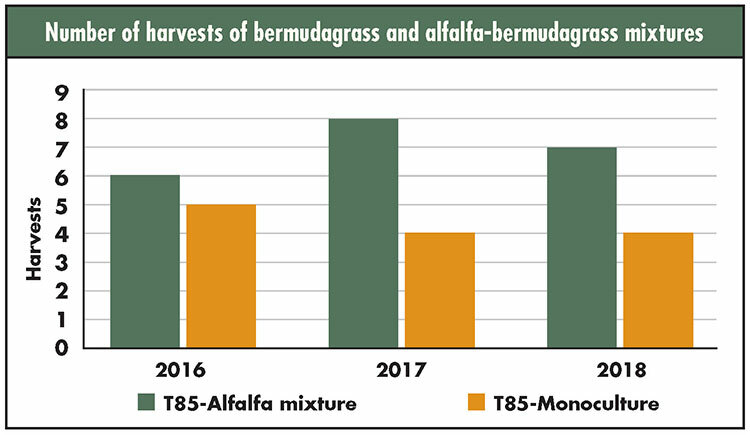 Alfalfa-bermudagrass mixtures were harvested three times in 2017 (March, April, and May) and twice in 2018 (March and May) before the bermudagrass monoculture was cut for the first time each year in June. Additionally, the mixture produced an extra harvest each fall after the bermudagrass had gone dormant for the season. On average, the alfalfa-bermudagrass mixture produced seven harvests each season while bermudagrass averaged only four (see graph). These additional harvests ultimately led to the alfalfa-bermudagrass mixture out-producing the bermudagrass monoculture by almost 5 tons over the three-year period. Though we may not have expected the additional yield in the alfalfa-bermudagrass mixture, the quality advantages came as no surprise. Bermudagrass quality is moderate and highly variable with forage maturity. Good quality bermudagrass is typically high enough in quality to easily support a dry cow with crude protein ranging from 10 to 14 percent and TDN from 50 to 55 percent. Animal classes with higher nutrient requirements, such as a beef cow at peak lactation, would likely need some additional supplementation to meet her needs. Adding alfalfa to the mixture can lead to crude protein levels of 14 to 18 percent and TDN values of 60 percent or greater, which meets the nutrient requirements of most animal classes. Using alfalfa rather than other supplementation can help enhance the profitability of a livestock operation. Even with weather challenges and weed pressure, the alfalfa-bermudagrass mixture showed a marked advantage in quality. Because the alfalfa was established in the spring of 2016, rather than the previous fall, there was a consistently larger percentage of bermudagrass throughout all harvests in the first year. Additionally, extreme drought across much of the South added extra weed pressure, especially during the mid-summer harvests. Although the amount of alfalfa in the mixture was lower than expected in 2016, crude protein was greater in five of the six harvests and TDN was 3 percent greater than in the bermudagrass monoculture. On the other end of the weather spectrum, the 2018 season was so wet that even baleage producers struggled to make timely harvests of their forage. Even with wet conditions and delayed harvests, the mixture had a 7 percent higher crude protein and 6 percent higher TDN compared with the monoculture. Researchers are also hoping to evaluate recommendations for feeding baleage once it is stored. Current recommendations are for producers to feed baleage within nine months; however, this may not match producers’ needs or allow enough feeding time in high-yielding years. Bales from this study were wrapped, stored, and sampled to monitor baleage for possible changes in forage quality throughout storage. Bales are sampled at six weeks and then nine- and 12-months postharvest to evaluate specific time points. After six weeks postharvest, baleage fermentation is considered complete and bales are ready for feedout. The nine-month time represents the current feeding recommendation, while a 12-month storage time would likely provide extra flexibility for producers to effectively utilize stored forages. Preliminary data indicate that there were minimal changes in nutritive value in the 12 months postharvest storage. Total digestible nutrient concentrations and in vitro dry matter digestibility both declined between the harvest and postfermentation (six weeks) sampling. While the bermudagrass bales were not affected by the additional storage time, TDN of alfalfa-bermudagrass bales did decrease between nine and 12 months. This decline in TDN was less than 3 percentage units, signifying that bales stored for up to a year would likely still meet the requirements of a dry beef cow. Minimal changes in nutritive value over a longer storage period could mean that updated baleage feeding recommendations are in the works. While the longer storage period provides producers with additional feeding flexibility, it would not be without challenges. Producers considering a longer baleage storage period would need to implement strategies to maintain plastic-wrap integrity and prevent spoilage. 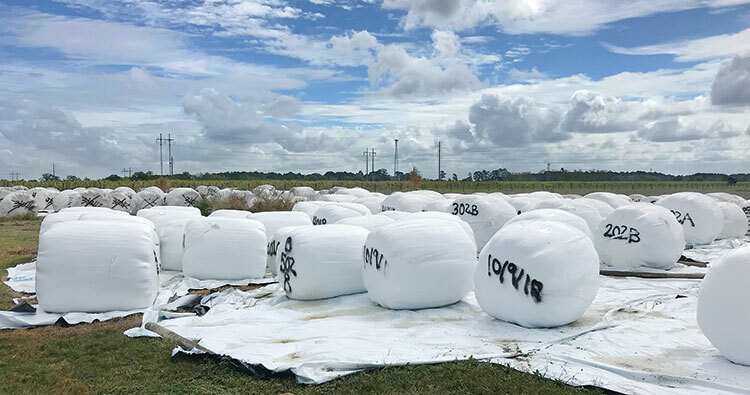 Changes could range from using additional layers of plastic during wrapping to frequently scouting bales and repairing any tears or punctures that could allow air or water into the bales. Incorporating an alfalfa-bermudagrass mixture can add another tool to the arsenal of producers who hope to improve forage quality without sacrificing yields from their bermudagrass stands. Pairing this mixture with a baleage operation can add harvest flexibility and alleviate weather challenges of traditional dry-hay systems. This winning combination of alfalfa-bermudagrass baleage could be a game changer for producers who say “yes” to alfalfa in the South. This article appeared in the February 2019 issue of Grower on pages 10 and 11.